I said I didn't really care for poetry and I meant it. But when Amy over at Hope is the Word pointed out this little treasure - Laura Ingalls Wilder's Fairy Poems - I knew I had to obtain a copy (and I did so immediately.) I do like fairies, which is entirely the fault of Lucy Maud Montgomery who make me want to believe that they exist. "I have a feeling that childhood has been robbed of a great deal of its joys by taking away its believe in wonderful, mystic things, in fairies, and all their kin. It is not surprising that when children are grown, they have so little idealism or imagination, nor that so many of them are like the infidel who asserted that he would not believe anything that he could not see. The Quaker made a good retort, "Friend? Does thee believe thee has any brains?" Imagination in a child leads to success in adult life. People who have a developed sense of creativity and imagination are far better problem solvers. I think it excessively important that children learn to be imaginative. (It's very true that some must learn it. Others seem to have a natural knack for it!) It is because of this belief that I have zero issues introducing my children to great myths and fairy tales. I want them to be filled with awe and wonder by the stories that they hear. I can already tell that the stories they internally process cause them to be creative in their play. I'm very happy to have a copy of Laura Ingalls Wilder's Fairy Poems on hand now and I anticipate many happy years making good use out of it! 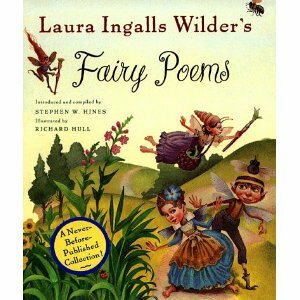 To learn more about this book and also to see what Amy thought of it, click over HERE to read her review of Laura Ingalls Wilder's Fairy Poems. This particular blog post, by the way, does not just highlight a book but the inherent dangers of blogging about books and reading other people's blogs. I, too, fall prey to the overwhelming *NEED* to read books that the rest of you are talking about. Amy might have affected my pocketbook this last week but the reward of a good book is not to be underestimated! Thanks, Amy, for the fun of a good read! I agree with Amy...I love your recommendations! This looks very cute...hmmm...birthday gift for M? Oh goodness! I'm a Laura Ingalls Wilder nut (and, if it's good poetry, I've got a weakness, haha) ... Must. Get. My. Hands. On. This! I love Laura and I have not heard of this book, I will put it on my list though! There were a couple of her fairy poems in one of the books I read for the LIW challenge. I was struck that her overall writing was straightforward rather than flowery, and her poetry seemed the same, even though it was poetry and about fairies. I agree 100% in incorporating and encouraging childhood (and adult!)imagination. People may go about it various ways, but that's the great thing about imagination -- it can go down different tracks. I'm just glad you're beginning to see the light! This book sounds delightful, by the way.